Additional "picks", over 18, are $.02 per pick, per Decal. Please identify repeat orders with the previous order number and year it was produced. Orders subject to within 5% over or underruns. Get the look of elegant hand painting at a fraction of the cost! 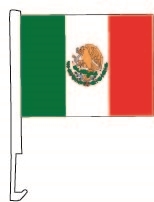 Flag dimensions: 2 foot 2.5 inch by 9 foot 8.5 inch. Pole height: 13 foot by 10 inch tall. Double-sided available. For most cars, trucks, vans, and SUVs. A quality product at a low price. Can support up to 6,000 pounds! Shipped anywhere in the U.S, Rust prohibitive black paint. Constructed from high quality welded A500 cold from hot roll carbon steel. Two different side tilt styles also available. 4x4 design also available! One of the highest quality products on the market! Easily attaches to any car or truck side window with white plastic molded clip. Great for any vehicle with a retractable antenna. 11 inch tall by 13 inch wide. sold individually. Will not blow off. Polyester cloth flag with double sewn hemmed edges. Sturdy 20 inch tall white plastic staff with wide molded clip. Molded clip includes double sided adhesive foam to help the clip stay on when a window is rolled down. Addition of the Boom Pole insures these Clip-On Flags will always "fly", regardless of the wind conditions so your message can always be seen! Premium polyester cloth, double sewn hemmed edges. Durable 24 inch tall plastic pole with wide molded clip that easily attaches to windows. Dimensions: 13 inch tall by 15 inch wide. Double sided flags. Perfect for vehicles with retractable antennas. Sold individually. Custom imprint available. Draw attention to your windshields. Put a star on that special car. Shrink wrapped by the dozen. 6 color combinations. Easy & effective way to highlight the windshields of your cars. Compliments other numbers & signs. E-Z on & E-Z off: no gummy residue. Waterproof vinyl with a removable adhesive. 5 inch tip to tip. Balloon holder window clip that contains your balloons with out twisting or bending. One of the highest quality products on the market! Easily attaches to any car or truck side window with white plastic molded clip. Great for any vehicle with a retractable antenna. 11 inch tall by 13 inch wide. sold individually. Will not blow off. Polyester cloth flag with double sewn hemmed edges. Sturdy 20 inch tall white plastic staff with wide molded clip. Molded clip includes double sided adhesive foam to help the clip stay on when a window is rolled down. One of the highest quality products on the market! Easily attaches to any car or truck side window with white plastic molded clip. Great for any vehicle with a retractable antenna. 11 inch tall by 13 inch wide. sold individually. Will not blow off. Polyester cloth flag with double sewn hemmed edges. Sturdy 20 inch tall white plastic staff with wide molded clip. Molded clip includes double sided adhesive foam to help the clip stay on when a window is rolled down. Sturdy 20" tall white plastic staff with wide molded clip that easily attaches to any car or truck window. Great for vehicles with retractable antennas. Flag measures 11" tall x 13" wide on premium cloth with double sewn hemmed edges. Sold individually. Draw attention to your windshields pricing & messaging. Non-fade. Waterproof vinyl. Back slit application. Shrink wrapped by the dozen. E-Z on & E-Z off: no gummy residue. These bright yellow Happy Faces will add color and draw attention to windshield pricing and messages. Slit on back for easy application. Shrink wrapped by the dozen, E-Z on & E-Z off: no gummy residue. 6 inch diameter. Waterproof vinyl with a removable adhesive. 4styles available as shown. These bright yellow Happy Faces will add color and draw attention to windshield pricing and messages. 6 inch diameter. Waterproof vinyl with a removable adhesive. 4styles available as shown. These bright yellow Happy Faces will add color and draw attention to windshield pricing and messages. 6 inch diameter. Waterproof vinyl with a removable adhesive. 4styles available as shown. Draw attention to your windshields pricing & messaging. Non-fade. Waterproof vinyl. Back slit application. Shrink wrapped by the dozen. E-Z on & E-Z off: gummy residue. 7 inch tall by 3 1/4 inch wide. Draw attention to your windshields pricing & messaging. Non-fade. Waterproof vinyl. Back slit application. Shrink wrapped by the dozen. E-Z on & E-Z off: gummy residue. 7 inch tall by 3 1/4 inch wide. Draw attention to your windshields pricing & messaging. Non-fade. Waterproof vinyl. Back slit application. Shrink wrapped by the dozen. E-Z on & E-Z off: gummy residue. 7 inch tall by 3 1/4 inch wide. Draw attention to your windshields pricing & messaging. Non-fade. Waterproof vinyl. Back slit application. Shrink wrapped by the dozen. E-Z on & E-Z off: no gummy residue. 6 inch diameter. 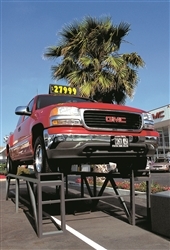 Draw attention to your windshields pricing & messaging. Non-fade. Waterproof vinyl. Back slit application. Shrink wrapped by the dozen. E-Z on & E-Z off: no gummy residue. 8 inch diameter. Draw attention to your windshields pricing & messaging. Non-fade. Waterproof vinyl. Back slit application. Shrink wrapped by the dozen. E-Z on & E-Z off: no gummy residue. 7 1/2 inch by 6 3/4 inch. Draw attention to your windshields pricing & messaging. Non-fade. Waterproof vinyl. Back slit application. Shrink wrapped by the dozen. E-Z on & E-Z off: no gummy residue. 6 1/2 inch by 7 1/4 inch. The perfect tag for any occasion! Waterproof vinyl with removable adhesive. Slit on back for easy application. 6 inch tall by 14.5 inch wide. 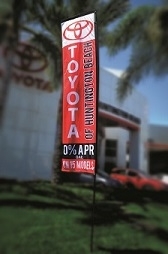 Printed on both sides, these portable signs are great for attracting attention to your dealership. They can also be used for tent sales and off-site sales events. Made from durable plastic, they are weather proof and virtually fade proof. 30 inch tall by 10 inch wide. Signs sold separately. Step stake design. Low cost "H" wire frame. No helium? No Problem! Check out our line of No Helium Reusable Balloons. Custom designs available! Draw attention to your windshields pricing & messaging. Non-fade. Waterproof vinyl. Back slit application. Shrink wrapped by the dozen. E-Z on & E-Z off: gummy residue. 11 1/2 inch long by 7 inch tall. Draw attention to your windshields pricing & messaging. Non-fade. Waterproof vinyl. Back slit application. Shrink wrapped by the dozen. E-Z on & E-Z off: no gummy residue. 6.5 inch tall by 8 inch wide. Draw attention to your windshields pricing & messaging. Non-fade. Waterproof vinyl. Back slit application. Shrink wrapped by the dozen. E-Z on & E-Z off: no gummy residue. 6 inch diameter. Pole guaranteed not to break. With the help of our efficiently designed clips, clasp your poles onto car windows to showcase the show cars.